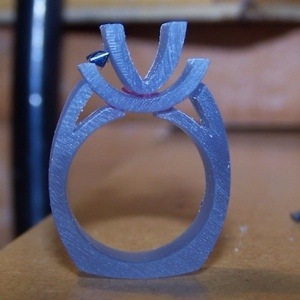 For this engagement ring I carved and cast it in 3 pieces so I could polish each piece individually before assembling. Whereas, all the nooks and crannies were able to be cleaned up. 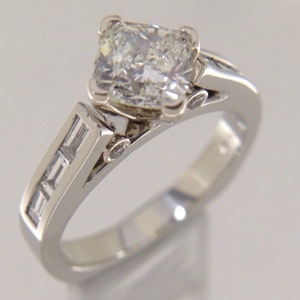 The center princess cut and side princess cut diamonds were channel set and the ring given a final polish. Sorry, I did not get a good finished picture of the ring in a controlled light box. 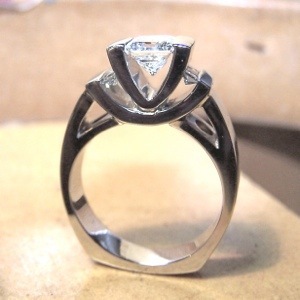 Compass set radiant cut diamond ring. There are a few cool things about this ring. 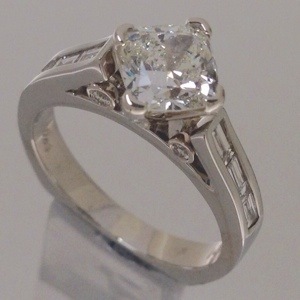 “Compass” setting a square diamond is always a fun way to set a diamond. 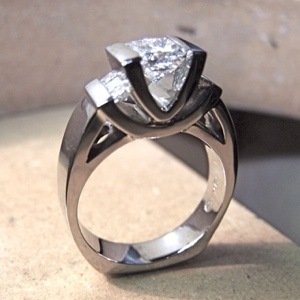 That orientation is a great twist to give a modern feel to an engagement ring. 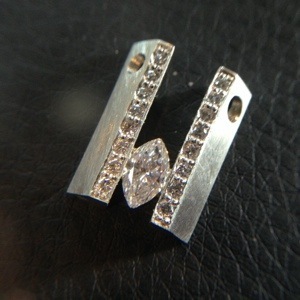 This stone is a modified Radiant cut and it is different then princess cut. It is a gorgeous diamond. 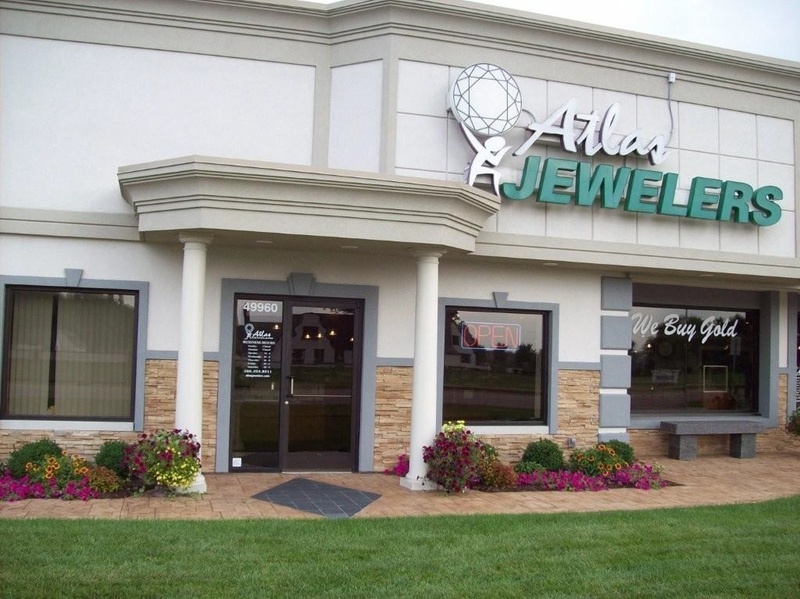 We custom made the ring in house. The baguettes, channel set end-to-end, gives an interesting visual appearance. Next time I make a ring again with baguettes set that way, I will get a matching set of stones before carving the wax, when I have the most flexibility. I had to sort through a pile of hundreds of stones of many various sizes. Getting a perfectly matched set of baguettes, with the same length to width (to 1/10th of a mm), to fit the existing channel took more effort then if I made the channel to fit the first set of 6 matching stones I find. But the end result was great. 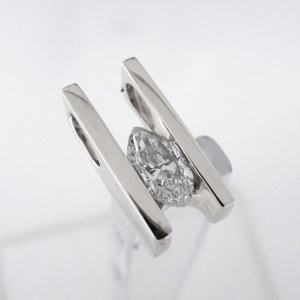 Both profile sides of the ring have two bezel set round diamonds. 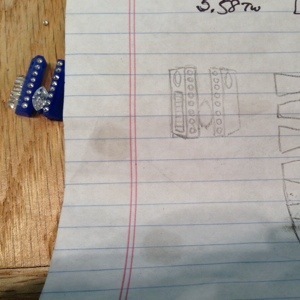 I first soldered the bezels on a scrap ring. Then I set the diamonds. I unsoldered the bezels, polished them and finally laser welded them in the new mounting. I was very happy how clean that turned out.